or simple shift dresses that don’t have any interesting details to them that announce your individual style. This doesn’t have to be the case, however. 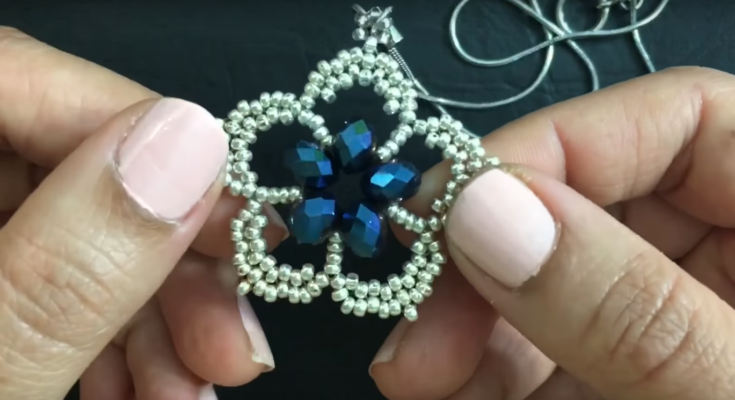 If you too are tired of wearing single color tees, jeans, and plain old sandals, there’s a simple, snazzy solution: the beaded flower pendant from Sonysree Creations on YouTube. What I like about this project is that it is so versatile. You can dress it up or down, glam it up or personalize it by integrating your favorite team’s colors, and you can add it to your ensemble as a brooch, a ring, a necklace, part of a bracelet, a phone accessory, or even string a bunch together for a belt. You can use one to adorn your summer straw hat, or add some pizzazz to your flip-flops and sandals. Let your imagination take over and style this powerful little flower any way you choose. You can also use these around the house to spruce up the place for a summer event like a pool party or backyard game night. Use them to tie back curtains, or to hold napkins in place, or even hung up along with the twinkling lights and tiki torches on the patio. To make one of these pendants, you’ll need to gather the following materials: seed beads in your preferred colors (for a more springy look, try using pastels. For summer, you can choose bold primary colors, jewel tones, or beachy colors), a beading needle, scissors, fishing thread, a pendant bail, a jump ring, and five (5) 8x6mm Rondelle beads. You can follow along with the beading tutorial on YouTube (it’s under twenty minutes long, but if that’s a little too long, you can always watch it with the volume off and at a higher speed. Once you’ve completed one flower, you may want to try experimenting with the pattern, the size of the beads, and the overall look of the flower, adding or removing petals, adding in leaves, or something along those lines. Look up flowers that are common in your area and pattern your pendant after those, or take a look at exotic flowers for more inspiration. While these are fun accessories for your own outfits, they would also make great gifts, either as party favors, wine glass charms, or as part of a welcoming present for a new neighbor. People of all ages will love the personalized touch, especially if you know what their favorite colors or flowers. Whether you want to make these for yourself, someone you love, or to spice up some accessories and decorations for your home, these are the perfect complement to any occasion or outfit. You’ll enjoy putting these together, especially if you take the project out on the front porch or back patio to soak up some sunshine. You can find the free tutorial from Sonysree Creations on YouTube.